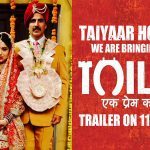 Much anticipated offering of superstar Akshay Kumar and Bhumi Pednekar, Toilet Ek Prem Katha which was earlier supposed to release on 2nd June, is now re-scheduled for 11th August 2017 opposite to Shahrukh Khan & Anushka Sharma starrer Imtiaz Ali’s next. Akshay was the first one who booked Independence Day 2017 for his movie Crack, which was later postponed to next year. Still there is no final confirmation from Shahrukh & team, but Akshay has declared the release date of Toilet Ek Prem Katha with it’s first look poster. On Thursday i.e. 30th March, the actor took to Twitter to share the official poster of his upcoming movie. 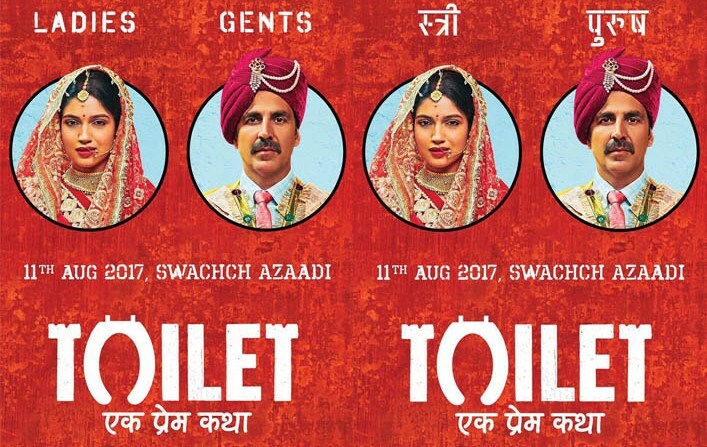 He captioned the picture, “Pleased to share, @ToiletTheFilm an unusual love story will be with you on 11th Aug, 2017. Tayyar ho jayye Swachch Azaadi ke liye!”. “तैयार हो जाइये स्वच्छ आज़ादी के लिए l टॉयलेट – एक प्रेम कथा, एक अनोखी प्रेम कहानी आ रही है – ११ अगस्त, २०१७ l” he added with the Hindi poster. Akshay is known for his unique & reasonable promotional strategies, which generate impressive hype for his movies among fans as well as audience. Still around four months are there in the release of Toilet Ek Prem Katha and it has already started creating buzz. Director Shree Narayan Singh’s this venture stars Bhumi Pednekar opposite to Akshay Kumar. The first look poster features both dressed in traditional wedding attire and promises for an interesting and unusual love story, with a strong message on ‘Swachch Azaadi’ Clean Freedom. Produced by Friday Filmworks, Grazing Goat Pictures, Abundantia Entertainment and KriArj Entertainment, Toilet Ek Prem Katha also stars Anupam Kher and Sana Khan in supporting roles.